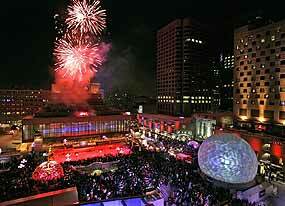 Montreal is well renowned for its festivals. And -20 C outside won’t stop us from having one! “Montréal en Lumière” or Montreal Highlights goes from February 16th to 26th, cultural and gastronomic activities are the mains attractions of this festival. This 11 days event is divided in four parts: Arts and shows, Fine dinning, Outdoor activities and the “Nuit blanche”. A lot of artists come to Montréal for this particular occasion, we can think of Tiken Jah Fakoly, one of the most famous African singers. For the gastronomic part of the festival, different restaurants invites chefs from a specific region of the world every year. This year isBelgium, so a lot ofMontrealchefs take a week off and hand out their kitchen and their staff to an invited chef from this country. Who says “festival” says outdoor activities! It’s cold outside and you probably don’t want to stay to long in the cold weather but that’s whatMontrealen Lumière is all about! There are a lot of outdoor shows and activities and there is only one way to beat the cold: dance and have fun!